Tokyo Japanese Restaurant - Blog: Back in time: 2006 - Tokyo Time! Back in time: 2006 - anul in care Tokyo Japanese Restaurant (Marinescu, 5) si-a marit echipa, a adus mai aproape istoria japoneza de clujeni si nu numai, anul in care ai inceput si TU, prietenul nostru de azi, sa iubesti Sushi! 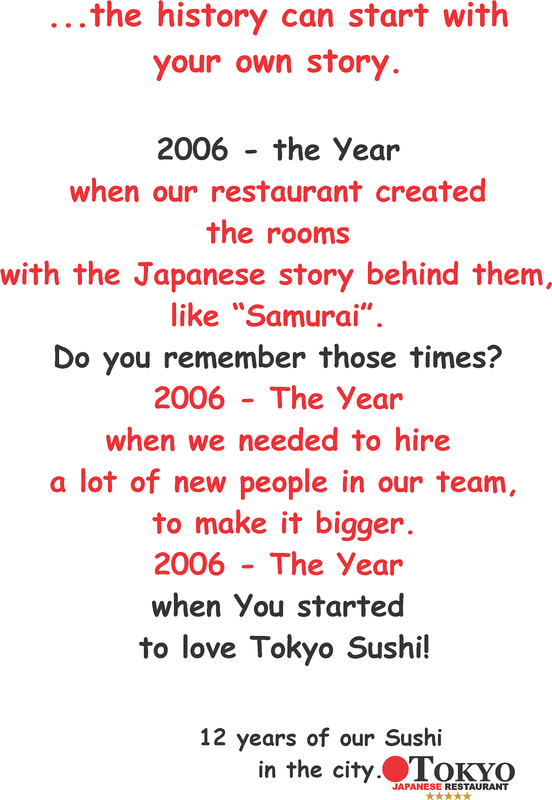 Back in time: 2006 - the year when Tokyo hired a lot of staff, the year when we told the history of Japan, not only the culinary one, the year when You started to love more & more the Sushi!